Just read over my last post and can't believe that I haven't written a post in a month and a half and how much has been happening since then. My foot/ankle is improving, if not fast enough for my tastes! My doctor had me taking massive doses of anti-inflammatories for 10 days and the swelling and inflammation went down at least temporarily. I was on my feet this past Friday and Saturday at the Guild Quilt Show on cement floors and Sunday was a hard day but both legs and feet were unhappy. Monday when I went to work I was pleasantly surprised to find that I could walk at close to normal speed without limping and even the stairs weren't bad. I got my two quilts finished for the quilt show and I was really happy with how they both turned out. I will do another post soon showing the quilting on this first one. The small tag hanging under the label says "A GUY likes this quilt." Every man who came in received one of these tags to put on a quilt he like. This quilt eventually received two of these tags and the other received on. This one is my 2004 Shop Hop Quilt. 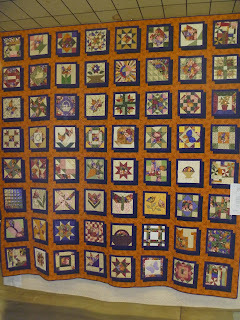 I had it in the Relay for Life Quilt Show in March but I added some more quilting in the block 'shadows' so the blocks would stand out a little more. Tonight I plan to take the hanging sleeve off so it can be put on our new bed. Fall is definitely here in Western Washington. We had about a week of fog that just didn't lift and now the sun has been out for a few days and it is gorgeous! Our son has been helping get the leaves picked up from the yard. Today we got 4 loads of leaves hauled away and yesterday and today I got most of the mowing done and let SIL finish it off. I can sure feel it in the muscles that I was out working in the yard! I have gotten quite a few Harry Potter blocks done for the quilt I am working on but with other things going on I realized I would not have it done for the quilt show. 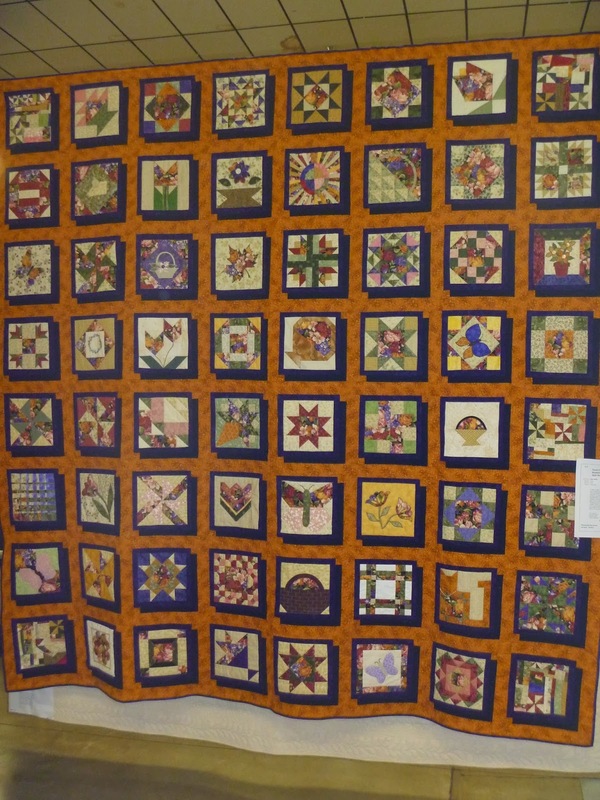 I did finish the hand quilting on my 2002 Shop Hop quilt but I don't have any pictures of that yet. I will try to get that done soon. I finished a border on one round robin project and have one more I hope to get to tomorrow so I can pass them off to my niece and get some others from her. We need to get them moving along again. She and I have both have had crazy summers. Our daughter and son-in-law got their little house on wheels moved out to its 'new' home and are pretty much settled in. Our son is settled into our Argosy until he finds a 'real' job. For now he is doing some math tutoring and helping around the house some. There are rumors we will have grandkids here for Halloween so might have to do some quick planning for a fun family party. We are thinking decorating gingerbread haunted houses or maybe Halloween sugar cookies. 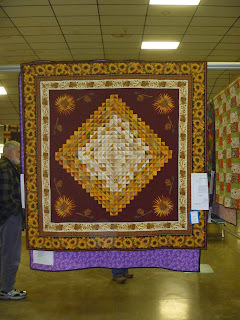 I need to pull some things together next week for a quilt retreat too.